You know how it is; you break up with someone great because you’re convinced it’s the right thing to do. Maybe the timing is wrong or you think there’s something more suitable out there. Time passes. Nothing better presents itself. You don’t have the self-revelations you thought you might. And so you begin to revisit the decision, flirting with the possibility that, this time, things could be different… and better. That’s how it is with me and Vancouver. I came here for a rest and refuel, as I’m inclined to do every couple of years since my 2006 heart-wrenching break up with the city at the end of things. 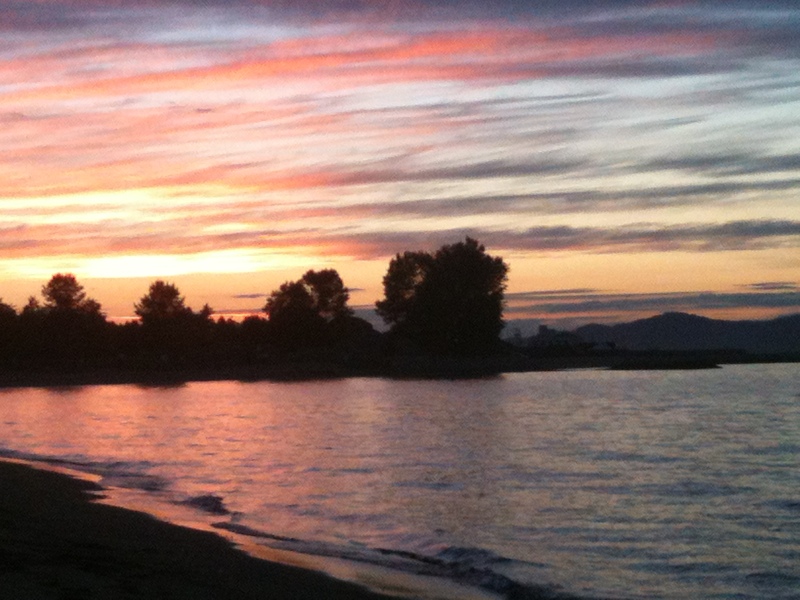 But tonight’s Jericho Beach sunset is the exact lure to get me thinking about staying. How can this sunset, and the blue hour it creates, go on nightly, weekly, monthly, yearly without me! Dusk is my favorite time of day, even without the blue upon blue upon blue of ocean, mountain and sky. You can’t live somewhere just because you like the weather, can you? Okay, maybe I should forget about the sun, Vancouverites are the first to remind me about its rare existence in this rainforest of a city. I must try to be practical and not let idealization creep in. It is true that I wasn’t always happy here and if I recall correctly I had a fair number of lonely days and nights. I struggled for work and money, for acceptance from new friends who feared getting too close because I might leave. I had a big and then a smaller heartbreak. 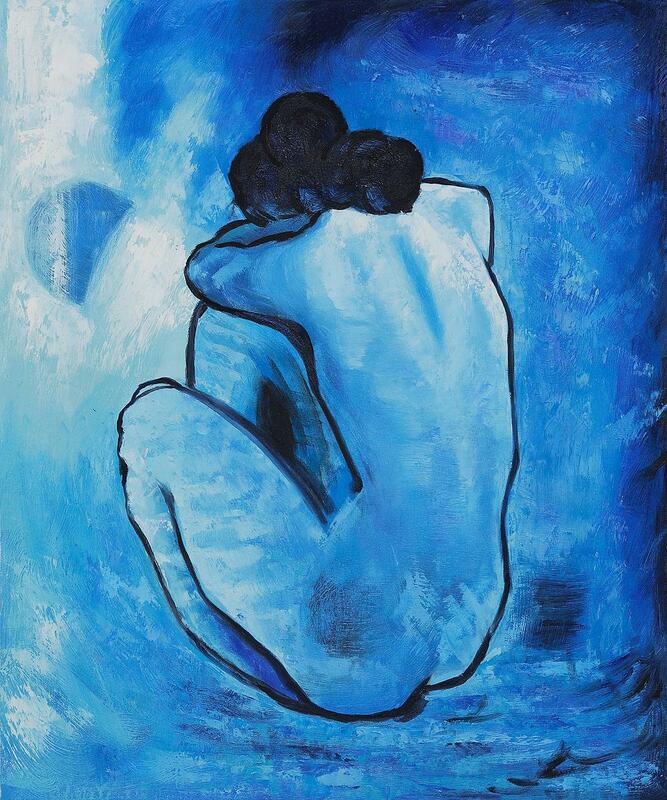 I dealt with the worry and guilt that comes when tragedy strikes far away back home. Through it all though, the certainty of a mountain in my view and the ocean surrounding it was usually enough to ground me. And I don’t think I ever took it for granted. 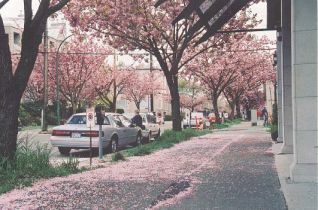 When I come to Vancouver now, I’m newly wowed by it, yet I have the luxury of knowing my way around, and feeling at home. 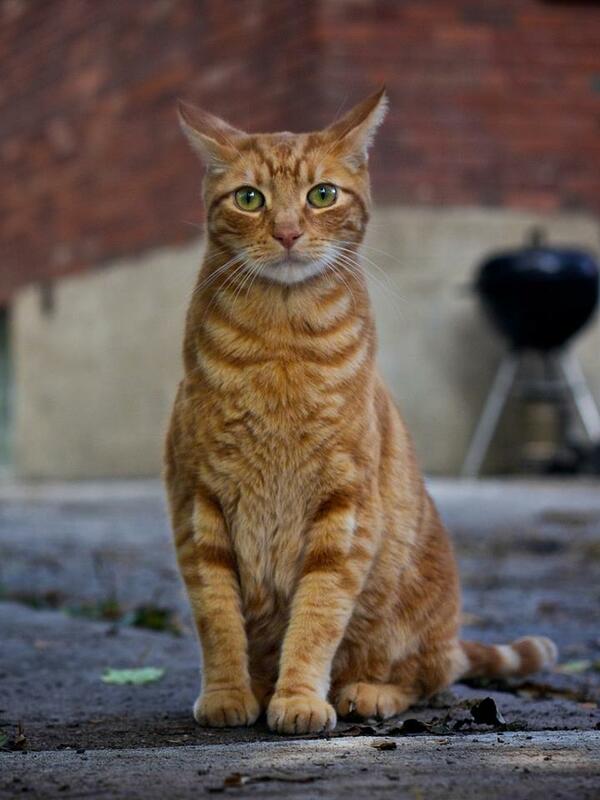 The first few days of my 3 week stay felt strange, even confusing, but then I started roaming. Retracing my steps is a habit I have, not just in Vancouver, but here I roam to remember my early days on the west coast, when my senses were so acute because everything was brand new. 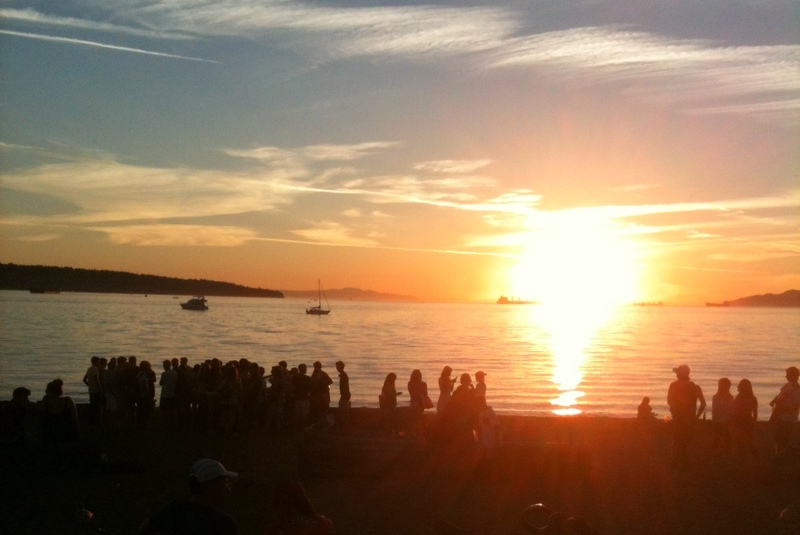 At English Bay I think of the first time I happened upon a sunset, only to discover a crowded beach of aficionados, picnicking, throwing footballs, playing music, holding hands. From that day forward it was a daily check for sunset time and a rush to watch it, no matter what. I simply had to see the sky change hues with every passing moment. Only in Vancouver do I fuss about missing the sunset. This visit, I’ve been alternating my viewing locations. Each one has different characteristics, each vantage point is unique. I’m trying to commit every single one to memory. I suppose it’s natural for Vancouverites to worship the sun, considering its shyness. 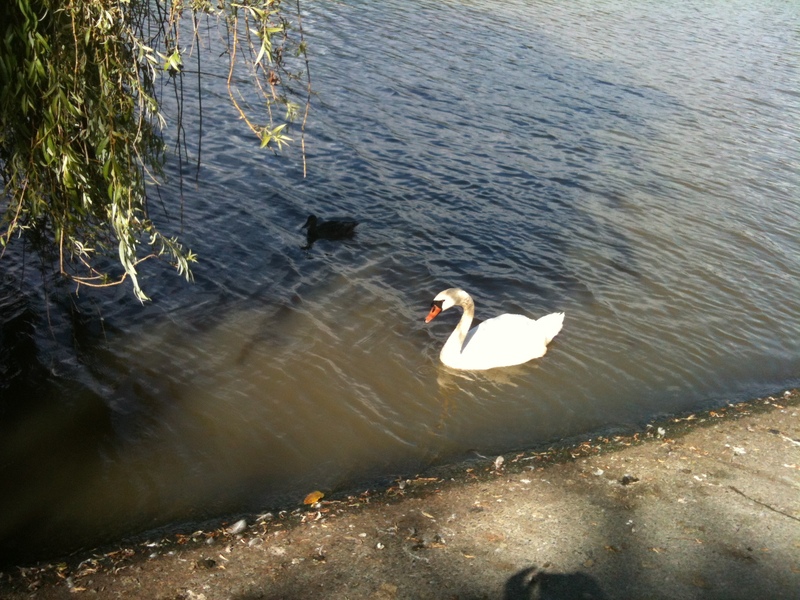 A West End roam wouldn’t be complete without a visit to Lost Lagoon and my beloved swans. My first spring in Vancouver I became part of a small but passionate community of Swan Watchers. We were joined in the mind/heart work of making sure their eggs stayed viable and in delight we surrounded the nests during hatching to just love the cygnets out of their eggs.We made sure our schedules allowed us to see their first tentative dip into the lagoon, and their awkward climb on mom’s back for their first twirl around. That spring was equal parts exhilarating and difficult and I pinned all my hopes for a successful Vancouver life on the healthy lives of those wee creatures. 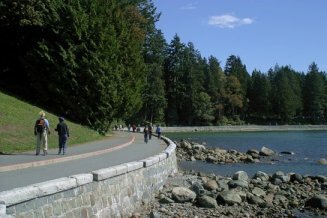 Walking the seawall conjures a 10-day trip I made in November 1999, two years after my mom died, when it rained every single day, which suited my mood and allowed me to cry without detection. At dusk one night, I made my way around the perimeter of Stanley Park, snapping pictures even as the rain fell. The sky was a brooding but hopeful mix of blue/grey/yellow and I made a vow that I would be living in Vancouver within a year. I framed that one photo and hung it in my work office to remind myself of the commitment. 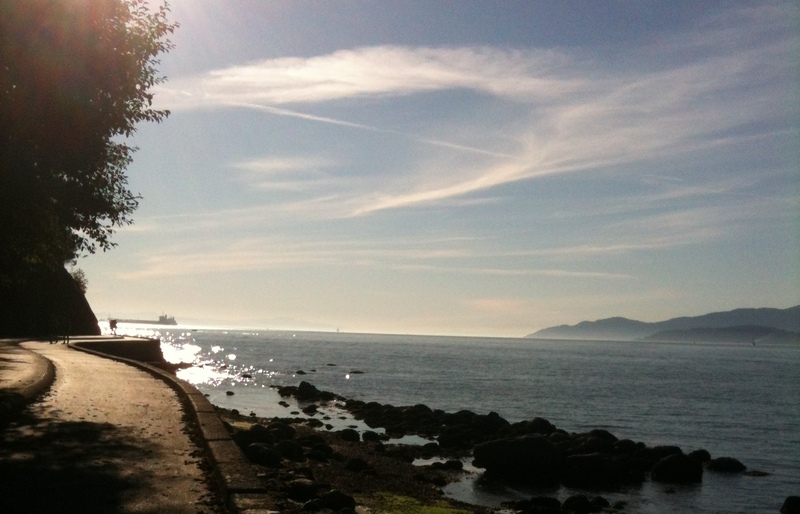 Seawall, Stanley Park, Sept 7 – a recreation of the framed photo in my office, on a much sunnier day! It was an easy goal to meet. 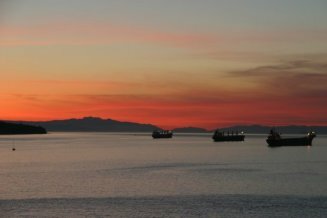 As I write this, I’m sitting mid-point Stanley Park seawall looking out into the open ocean. Tony West Van is on my right and the historic Siwash Rock on my left. Taking pen to paper at just this spot is so familiar. The first summer I lived here I would walk from my Alberni Street apartment, past Lost Lagoon, across the park to the seawall and along to at least this far. 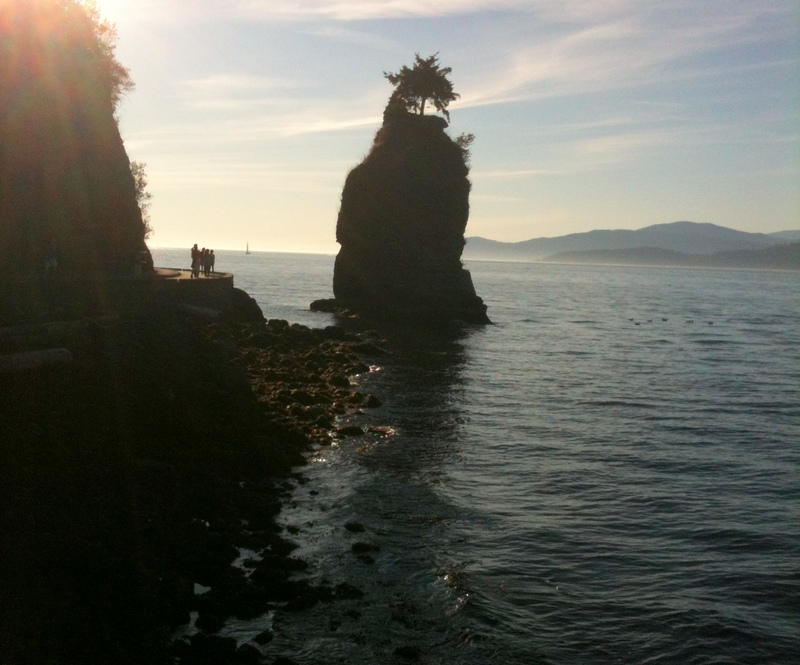 Then I’d double back to either 3rd, 2nd or English Bay beaches – depending on the value of my need for solitude. How many problems did I work out on those walks, on this bench, or laying in the sun listening to the waves? If I had to put my finger on just what this part of the world means to me which, let’s face it, I’m constantly trying to do, it would have something to do with the fact that it’s the place I made peace with the past, started fresh and learned to be my original self. I was finally able to alleviate the bottomless pit of loss the death of my mother had left, and learned to live without her. I learned how to be alone, and in the process discovered I prefer solitude. I lived for the first time on my own time and began to fully understand I’m a writer. I began to live as one, letting my creativity take me to new places and I followed it without fear. I learned to enjoy and appreciate the outdoor life, which up until then I regularly shunned, saying “I’m a city girl.” Not so, I found out. I became protective of the beauty of this place. I learned to open up my heart again, even if it meant getting it broken. In recent years, I’ve forgotten that one , and it’s had consequences. In Toronto I live a too static, too insular life. It never occurs to me to chase down a sunset, and though I live minutes away from the lake, I rarely go there. All this it very difficult to explain casually when asked, “what’s with you and Vancouver.” Easier to point to the beautiful surround of the city, no matter how cliché. In these last few weeks of summer 2012, I’ve roamed every part of Vancouver that I know and to which I have special memories attached: North and West Van, there on the seabus – which, much to my amazement used to to be my commuter venue to one of my Vancouver jobs – and back by the Lion’s Gate Bridge, and it’s breathtaking view (or, as Doug Coupland says “one last grand gesture of beauty, of charm, and of grace before we enter the hinterlands”). Commercial Drive to Cafe Calabria, my Italian touch-stone in the city, Granville Island, just because it’s there and it’s great. And home of the wonderful Vancouver Writers Festival, where I’ve spent much time listening to – and drinking with – my tribesmen and women a.k.a writers. A walk along Alberni and then Pacific to look in on my first ever and most recent Vancouver apartments. I’ve gone to all the old haunts, and relived a lot of great, and some painful memories. I should be exhausted from all the walking and remembering. Instead I’m relieved. It scares me when I think I’m forgetting the important time I spent living in Vancouver. But I’ve also added some new memories and connections. I’ve been staying in Kitsilano, on the opposite side of the bay to where I always lived, so my roaming has included places I’ve never spent a great deal of time. 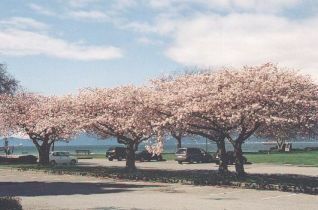 Kits Beach, Jericho Beach, Point Grey, getting to know the small businesses and cute cafes and bars on West Broadway and West 4th. A discovery of a new, growing part of town, Olympic Village. 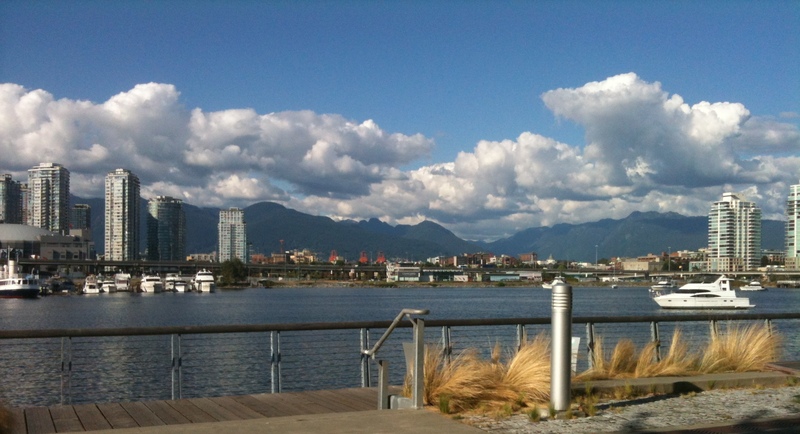 Seawall towards Olympic Village, a growing part of town. When I worked at Citytv on West 2nd, there was nothing there: no bus route, no Starbucks or any decent lunch spots, no fun place to go for after work drinks. Now there’s the beginnings of a vibrant community and a gorgeous new seawall walk linking Granville Island to Olympic Village to Yaletown and beyond. Now, I know there are some problems associated with this area of town, but from the point of view of fresh eyes, it’s good to see Vancouver not only growing, but with a renewed sense of civic pride born of the world’s favourable gaze during the 2010 Olympics. It’s what I hoped would happen. This luxurious stretch of time here – remembering the old and discovering the new – is maybe my attempt to reconcile my regret about having left, and to begin a process to decide what to do about it. Try again, or stay put. Is it where I should be living, or is it my second place, a place to come for peace and restoration. The one big plus on the side of returning has nothing to do with any place I saw, anyone I spent time with or any landmark I visited. 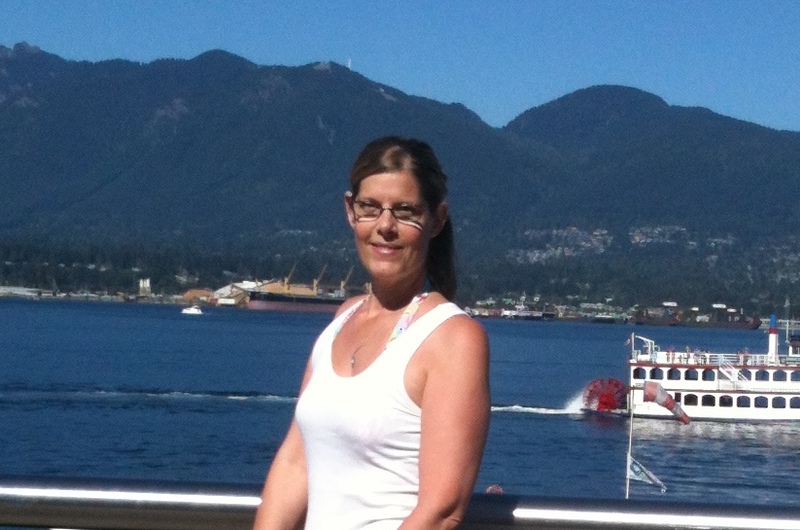 It’s simply this: I like myself better in Vancouver! Maybe Vancouver and I are due for a second chance.